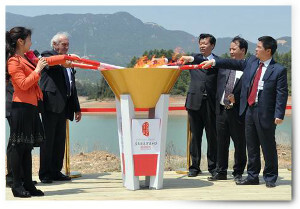 Academy President and CEO Dr. Thomas P. Rosandich participated Thursday, April 21 in the dedication of a new sports city in Fujian, China named in honor of Juan Antonio Samaranch, the former President of the International Olympic Committee (IOC). The launching of the “Juan Antonio Samaranch Sports City” comes on the first anniversary of the death of the Olympic icon in Barcelona, Spain. Samaranch stepped down as IOC president in 2001 after 21 years in the post and is credited for improving the financial health of the Olympic Movement, developing TV rights and sponsorship negotiations and strengthening Olympic Solidarity. 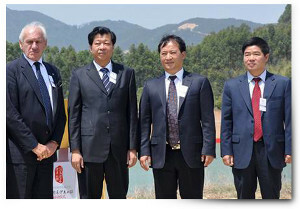 In China, Dr. Rosandich and Dr. Jie “Jack” Guo, the President of WorldTeam Sports, cut the ribbon for the development of the Samaranch city, which attracted about 200 government officials and distinguished guests. 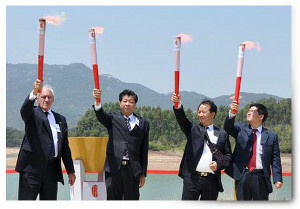 The event, seen as a major economic development catalyst for the Quangang region, was hosted by the United States Sports Academy, WorldTeam Sports, Quanzhou City and sponsored by several national and international organizations. This $1 billion project on 822 acres is the first of three cities that the Academy is working on with Dr. Guo, who is deemed the leading sport entrepreneur in China and who represents the NBA in that nation. 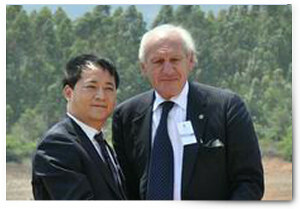 Dr. Guo is also the recipient of an honorary doctorate degree from the Academy in recognition of work to develop sports in the world’s most populous nation. Part of the city’s development includes the creation of a Sports Academy, which will provide much of the same sports-related academic content that is found at the Academy in Daphne, Ala. Other major elements will include the Samaranch Memorial Hall Museum, Samaranch Sports Park, Olympic Convention Center, International Sports Hall of Fame and the International Olympic Champion Training and Therapeutic Center.